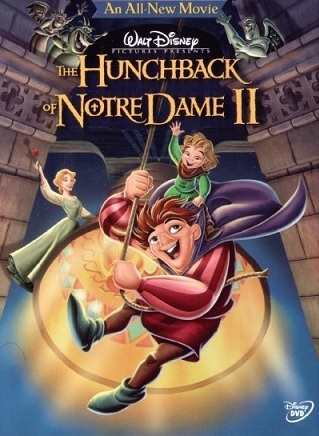 The 2002 sequel to Disney's 1996 Disney Animated Canon film The Hunchback of Notre Dame. Quasimodo falls in love with the beautiful and mysterious Madellaine, while trying to stop an evil magician from stealing a famous bell from the cathedral's belfry. Adult Fear: Zephyr's disappearance and Sarousch using him as a hostage. Art Evolution: More like Devolution. Despite coming out after The Lion King II: Simba's Pride, which contained some decent animation, the animation in Hunchback 2 is usually considered to be some of the worst amongst the Disney sequels, along with Aladdin: The Return of Jafar (which could be excused as an experiment in DTV) and Pocahontas II: Journey to a New World. It's especially pronounced compared to just how different the style is to the original. That said, there are some moments of fluidity despite the quality, as some scenes (or animations) look like they had more attention put into them than others. Babies Ever After: This sequel shows that Phoebus and Esmeralda have had a son, Zephyr. Becoming the Mask: Madellaine, who initially is friendly to Quasi only to find out information, but comes to love him after he treats her with genuine respect and affection. Big Brother Instinct: Quasimodo towards Zephyr. While he is already friendly to kids, this kid in particular is his honorary nephew. The Big Damn Kiss: Quasimodo and Madellaine share one at the end of the movie, after declaring their love for one another. The message from the original, and in the sequel, is supposed to be that you can't judge by appearances and true beauty is on the inside. Unfortunately it is distorted by the way that Quasimodo not only falls in love with the beautiful Madellaine, but she also goes through a rather formulaic HeelFace Turn, and the villain Sarousch is not really all that handsome to the viewer, despite his own vanity, meaning that the viewers get a solid Beauty Equals Goodness message instead. One of the movie's other messages, that prejudice is wrong, is also broken. Pheobus is portrayed as being in the wrong for his prejudice against carnies, and he says that he was wrong at the end. But he wasn't wrong; the carnies really were stealing from people, and Madellaine was the exception, so his suspicious were entirely justified! Chekhov's Skill: Madellaine's tightrope walking. Early on she confides to Quasi that she wants to learn it, and he encourages her. At the end, she pulls it off to save Zephyr. Crisis Makes Perfect: Madellaine struggles with her ambition to become a tightrope walker. At the end, she pulls it off to save Zephyr. Crocodile Tears: Sarousch, when he tries to pin the thefts on Madellaine. Cut Lex Luthor a Check: Considering how popular his circus is, surely Sarousch doesn't need to commit crimes. Excuse Plot: The theft of the bell is an excuse to pair Quasimodo with Madelleine. Good Colors, Evil Colors: Throwing any subtlety right out the window from the start, Sarourch is dressed in exactly the same colour scheme as Frollo from the original. Grand Romantic Gesture: One sanctioned by society. Parisians couples publicly declare their love during the festival. "I Can't Look!" Gesture: Phoebus has to look away when Sarousch forces him to let him sail away with "La Fidele", on penalty of Sarousch harming his son. I Have Your Wife: During the climax, Sarousch uses Zephyr as leverage for the bell. Innocently Insensitive: When Phoebus tells his suspicions against Madellaine plotting to steal the La Fidele with Sarousch, Quasimodo asks if Phoebus thinks if anyone could love him for him. Phoebus immediately realizes his error and corrects what he means in a slightly more tactful manner. Sarousch: What are you doing? Madellaine: Just standing around looking pretty. Jaw Drop: A literal one from the Gargoyles at the end. When Madellaine tells them she'll take good care of Quasi and winks at them, making her the first person other than Quasi to notice that they are sentient, causing them extreme shock. Lighter and Softer: Than the original movie. The villain here is a thief instead of a sexually repressed Knight Templar bigot. Narcissist: Sarousch. Phoebus lampshades it after interrogating him: "I'll let you get back to... yourself." No Song for the Wicked: Sarousch does not get a song. Not So Different: Quasi and Madellaine; both of them are clumsy and nice people who are dominated by evil father figures. Rhetorical Question Blunder: A small running gag in the sequel is Phoebus asking rhetorical questions to his Silent Snarker horse Achilles, who taps his hoof in response both times. The second time, he reports that the circus is responsible for robberies, which does not delight Quasi or his family (Quasi due to being romantically in love with Madellaine, Esmeralda due to believing that Phoebus still holds prejudice views towards gypsies, and Zephyr due to admiring the circus), and they all angrily leave. Phoebus: Achilles, do you believe this? Everybody mad at me! How often does that happen? Sissy Villain: Sarousch. He speaks in an effeminate way and is in love with himself. Throw the Dog a Bone: Quasimodo meets (and eventually) falls in love with Madellaine. Time Skip: The sequel takes place six years after the first movie. Ugly Guy, Hot Wife: Quasimodo and Madellaine get together in the end. What Happened to the Mouse? : Sarousch's band of minions from the carnival who he sent out to rob the townspeople are not seen again after they've done his bidding, and no mention is made of whether any of them were also arrested after Sarousch was caught.